Preeclampsia is a condition that affects some pregnant women, usually in the second half of their pregnancy (>20 weeks gestation). Preeclampsia causes high blood pressure, fluid retention (oedema) and protein in the urine (proteinuria). If left untreated it can cause serious health complications for both mother and baby. The condition is usually detected during routine antenatal appointments and the cause is not fully known. Cases can vary from mild to severe. 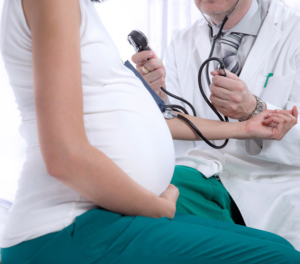 Mild cases can often be managed through regular antenatal blood pressure and urine tests whereas more severe cases may require closer monitoring in hospital. The only known cure for preeclampsia is the delivery of your baby.